It was just around tax day, mid April of 2015. My fiancé (boyfriend at the time) told me that we were doing "something different" for our next date night. 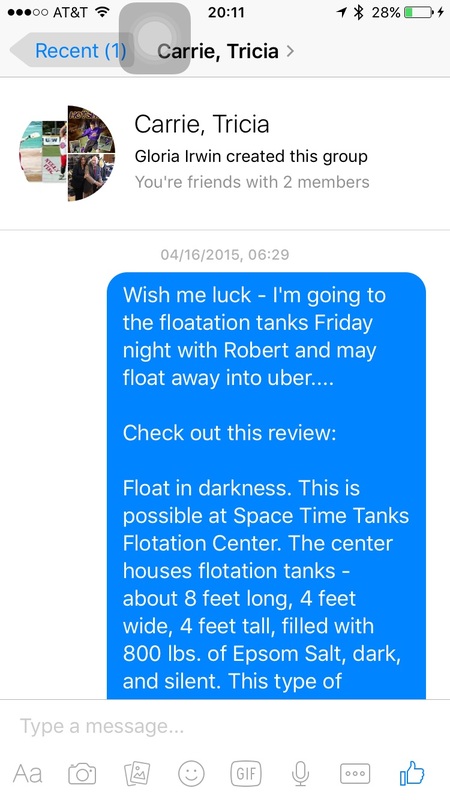 He went on to explain ... we were going to try this thing called sensory deprivation or "floating" in a dark, soundproof tank for sixty minutes. I remember feeling confused and I'm sure I had a puzzled look on my face. I thought to myself - why the hell would we want to do this? With no disrespect, the way he described it sounded completely unappealing. He had never steered me wrong before and I pride myself on being an adventurer so I reluctantly agreed and awaited the date. A few days before our appointment, we shared dinner with a couple of my high school friends and I couldn't help myself but to let them know about our upcoming adventure. It was almost as if I had to tell so someone would know where we were last seen in case we didn't come out of the tanks alive. Carrie and Tricia, my friends, looked like I felt - bewildered but curious. They insisted that we let them know how this crazy tank thing worked out and I joked about maybe never seeing them again to share. My fearful pre-float message to my girlfriends. Float time had arrived - we drive up to what I now know to be the longest running float center in the country, Spacetime Tanks in Chicago. I have to say, this was one of the most unique places in an even more unique building - just minutes away from where I was about to finish grad school at DePaul University. Spacetime rocks a new age vibe and is situated deep in the Lincoln Park neighborhood. I am sure the owners can sense first time floaters a mile away - silly questions about mutant monkeys and looks of apprehension can't be uncommon. I felt like a fish out of water in this place as I was never one who could relax easily and the people sitting here in the lobby all look so calm and peaceful. No one was even on their phone! It was so bizarre. 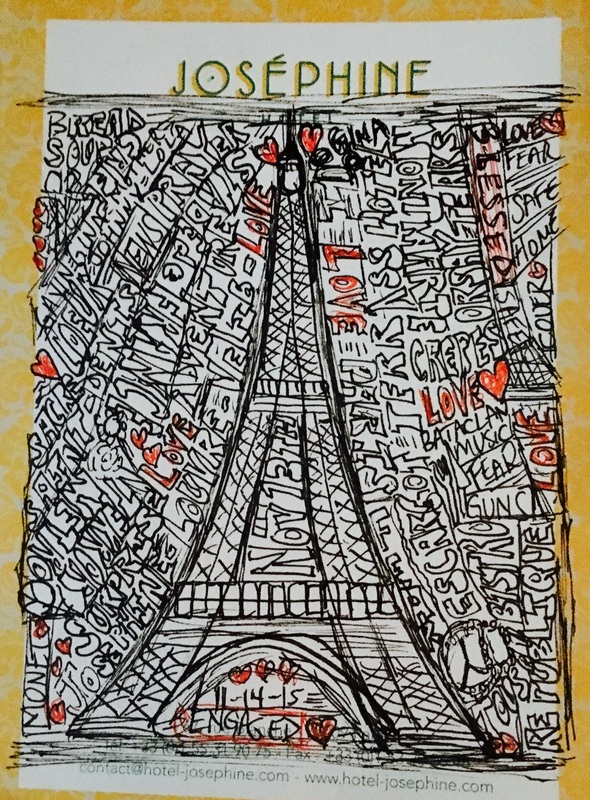 So awesomely bizarre. I have spent the last decade as a "Big Data" enterprise software professional - doing it long before the term "big data" became a thing. I am constantly plagued with easy accessibility and connectivity. Wired to everyone and everything all the time. Hell my nickname is GO-GO. I'm never still, always busy, always on. This was about to change. For at least sixty minutes anyway. I wouldn't classify myself as claustrophobic but I didn't like the idea of being in a strange place in a steel box with a door that is closed at my head. I was weirded out for the first 10-15 minutes for sure. I thought I was going to hyperventilate at one point and even had to open the door for a minute to make sure I wasn't blasting off. When the awkwardness subsided I was calm and still. I felt my heartbeat and became aware of some interesting things. Multi-colored flickers of light and faces in the "sky" of the tank were popping up as I opened my eyes. This was a really cool feeling and I remember trying to see more. Then I realized I was trying. I then told myself not to try. A surreal internal dialogue with myself ensued - a full conversation with no spoken word. The raw experience at Spacetime comes to an end when you hear three knocks on the tank. You knock back to let them know you heard them and agree to get out. That's it. Back to reality. Where's my phone? I so need to tell people they need to try this at least once. Exuding excitement about the impact of floating on my sleep. "I slept harder last night than I can ever remember" - this was the most impactful takeaway from my first float session. I now understand the science behind this - soaking your tired body in 1,000 lbs of dissolved Epsom Salts is no joke. My muscles loved me and thanked me for this sixty minute soak party. Who knew? Apparently very few people in my circles. My circles are big circles. Slews of hard working, tired, middle aged people chasing our kids and chasing our tails with no idea of how fast we are really going. Do we ever stop? We are high energy, high performing and high stress professionals. I am not one who could ever meditate - I want to be but I'm just not wired that way. This floating seemed "far out" and yes, I'll say it again, weird. How is it that an hour long activity with so much relaxation power is something people only heard about through some obscure movie called "Altered States"? I was on a mission to spread the word. 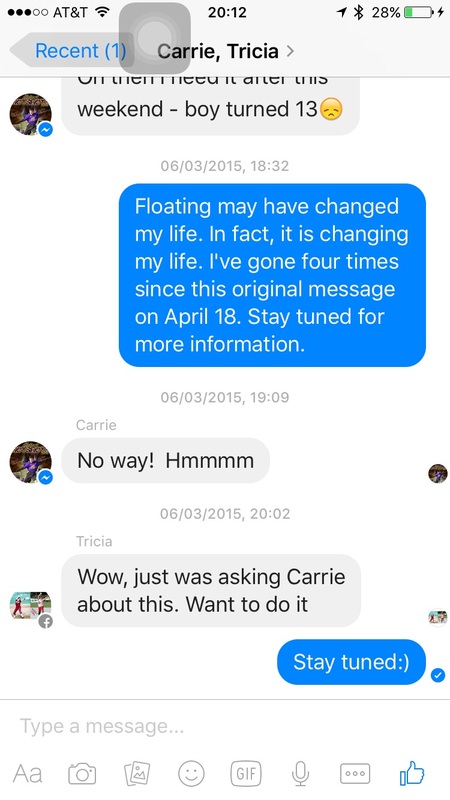 I was also on a mission to float again. Over and over, all around the country. Maybe I'll buy one for the house? Holy sh@t! These contraptions are expensive! There are even cool pod-like tanks with lights! I may need to invite my friends to use my tank to justify that kind of money. Hmmm. Wow! There are a lot of float centers out there! Portland seems to have it going on! There are some cool cats from a place called "Float On" that will even help you figure out if you can handle this business?? Hey now Chicago - up for a new float studio?! 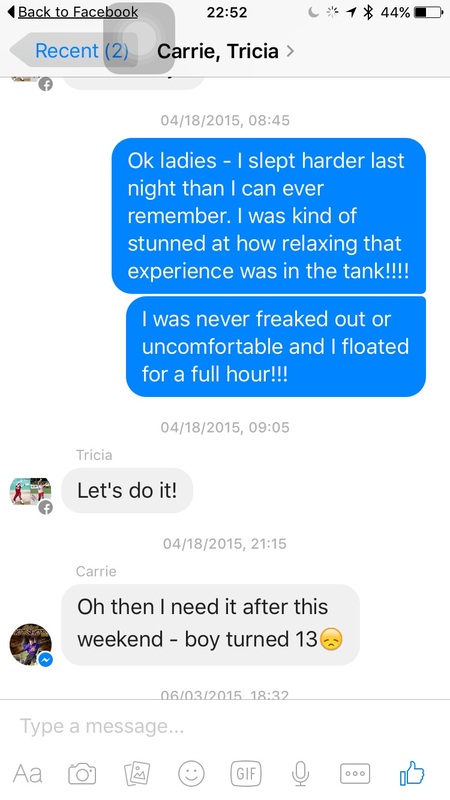 July 2015 - Location Identified, Location Denied, Location Identified, Location Denied, float like crazy, attend Tony Robbins "Unleash the Power Within" - on one rare break from the conference I am so motivated that I set up a call with my bosses and resign after ten years of working with same IT company, buy three float tanks. Leaking the news on the new business venture to my friends. First Float to Float Sixty - nine months. This has been a feat of epic proportions and it feels amazing to get to this point. I can't wait to share the most unique form of relaxation with the world.